Spring Break is just around the corner and for a lot of people that means travel!! Whether you head out on a nearby road trip or take a bigger getaway, it seems to be the beginning of all the summer trips to come! Earlier this week, we shared all of our must have family road trip essentials. So today I thought I’d give you a little video sharing my secret to simplifying packing your kids. I promise these 6 simple packing tips will save you time, money, and sanity within your travel life!! Now that you’ve had a chance to check out how we simplify packing and how easy it is, I’ve broken down the 6 tips for you below! When it comes to saving room and packing efficiently, this is a make or break. Have your little people wear their biggest, bulkiest items on their body, so those pieces aren’t taking up their whole suitcase. If you are going somewhere cooler, have them wear their jacket, sweatshirt, or cardigan. Jeans take up more space than shorts and leggings, so consider that as well. This way, you aren’t taking up the majority of your space with a coat, but you will still be prepared for weather conditions. If at all possible, we limit our shoes to 1 pair per child. Shoes are SO bulky and when you times it by 5 little people, it adds up FAST. When I make a list of what to pack, I try to consider all the activities/events during the trip. From there I will pick a pair that is versatile enough to wear for all if possible. Something comfortable that can be dressed up or down (as you’ll see on the video). If you do have to pack an additional pair, try to make it as slim as possible. A helpful tip is to face the bottoms in and wrap an elastic around them to keep from getting your other clothes dirty. When planning your outfits, always go for pieces that you can mix and match. Grab a pair of leggings that can go with 3 different shirts or one dress that goes with multiple leggings. That way you aren’t packing a completely new outfit for every day, saving on how much you are bringing. For the girls I try to pick one bow that goes with all the outfits too. Now that you’ve picked out their outfits, comes the most important step. Rollllll thier clothes by outfit, including underwear, socks, and accessories. Not only does this save a TON of space compared to folding, it also saves on a huge mess. 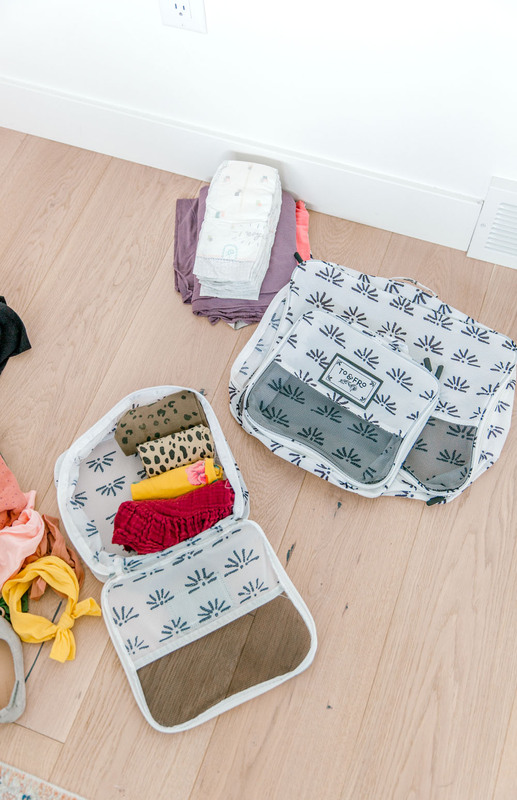 When morning rolls around, you can have your little people go to the suitcase and grab their outfit for the day without messing up the entire bag, because it is all in one convenient place. Now that you’ve got them rolled up, organize using packing cubes. We just got these new packing cubes and LOVE them. They are for sure the best we have tried and worked perfectly for our recent St George trip. We stuck each persons items in one cube. Since our trip was just a quick weekend getaway, we actually just used the packing cubes themselves for the kids and didn’t even need a suitcase for them. It was AMAZING!! I told them how much we loved their packing cubes and they are giving you all 15% off with code KAILEE15 !! Stock is a little bit limited right now, but I promise you will want to stay tuned. They have some fun styles coming out for summer!! Diapers take up SO MUCH SPACE! Don’t waste a whole suitcase on diapers ESPECIALLY if you are flying. My tip is to just pack enough diapers for the first day. That gets you to your destination and enough time to get settled. Then buy enough to cover you for the rest of the trip while you are there. I hope these tips and tricks help save you space and sanity as you pack for your next family trip!! I’d love to hear your favorite go-to packing tricks too! Love your video and blog post. We are going on vacation and this helped so much!!!! Thank you. Will you also do a blog post on Day in the life of you and your family? Your house is always So tidy and Clean. How do you manage that thru the Day what does it look like, To keep up on the messes and Keep things so Clean/simple/Tidy. Maybe you could also Talk about your minimalism thought process and Etc. Thank you for all you do for us Followers/ Instagram Watchers. Thank you for your feedback and ideas!! We do have a couple posts along those lines coming up, but I will add your other ideas to the list too!! Thanks so much for being here! Love this so helpful ANd I also love the VIDEO!! Love the Diaper idea! Never thought about that!! It is life changing!! Thanks for taking the time to comment! On your instastories you asked aBout the video … Love the video!! Thank you for tHe tips! Not only am i going to roll my littles outfits and have a packing cube for each of them while traveling but this will work nicely To help orga my diaper bag as well. Thank you so much for your feedback!! Means a lot! I love it so HELPFUL! I really liked the video can’t wait to see more videos !! !